There are quite a few Osmanthus in Michael Dirr’s Manual on Woody Plants. 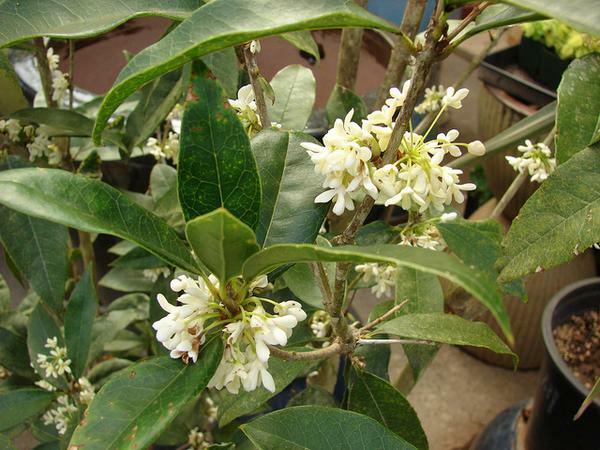 The one that I’m familiar with and in fact fell in love with is O. fragrans or fragrant tea olive. I feel this plant is highly under used in home landscapes. This slow growing evergreen tree is perfect in a landscape instead of quite a number of hollies that will quickly out grow a site and require pruning several times a year to keep them in shape. The tea olive requires only an occasional snip here or there. I’ve had one for several years and have never had to prune it except for one winter when the new shoots were damaged by the cold. I was able to snip the 4 or 5 stems back in just minutes. The leaves are a dark leathery green with some slight toothing on the edges. They are in no way scratchy like the leaves of some hollies. Some Osmanthus do have deeply toothed leaves that are scratchy but not O. fragrans. They only grow 10-15 feet tall, fitting in well in a small garden like the Fragrant Garden at the Sr. center. 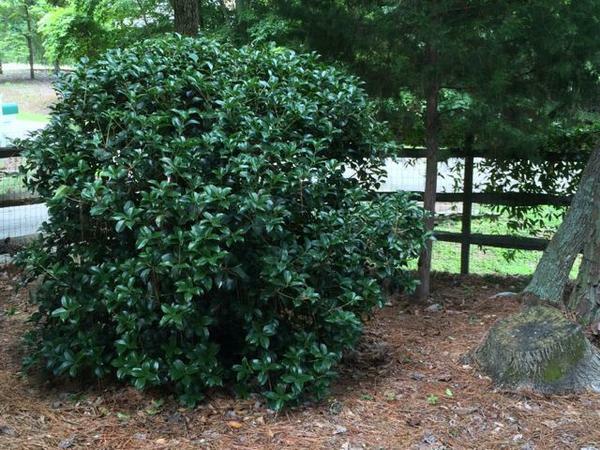 Last fall I replaced a Nellie Stevens holly that after 8 years had out grown my landscape. I was glad to get rid of the sharp leaves too. I have found that the tea olives I’ve seen are not particular about soil but prefer even moisture from an irrigation system. I have seen it in both full sun and in part shade in both amended soil and raw clay. Now for the best feature of the tea olive: Think about the word fragrant!! The tea olive has clusters of tiny white flowers starting in September and then sporadically thru the winter. My new tree in the front fills the entire front of my yard with it’s sweet light fragrance. The one on the back yards fills the entire area with the slight fragrance. The fragrance isn’t heavy or overwhelming. It makes you pause and sniff and then sniff again trying to pin point the source. O. fragrans can be found in most nurseries carrying trees and is not expensive. I have seen pictures of yellow and orange blooming cultivars. Some cultivars are not hardy in our area. They are also difficult to find and are much more costly. If you’re not sure stop by the Sr. center and give the one in the Fragrant Garden a sniff. Posted in Home Landscape, Master Gardeners, Perennial, Plant Profile, Shrubs. This entry was tagged Evergreen Shrub, Fragrant Plants, Osmanthus. Bookmark the permalink.